What are the Texas Hill Country Concerns? Extreme drought conditions will undoubtedly have adverse effects on the trees that exist in the area. Trees lose significant amounts of water directly through the leaves, twigs, branches, roots, and stems. Trees will react in a variety of ways. One of the effects of a severe drought is that permanent damage can occur. Here is a list of how trees are affected by severe drought and ways to reduce drought stress. Wilting- this is a visible symptom of drought. Permanently wilted trees can recover only when additional water is added. Stomatal Closure- Trees close stomata in response to rapid water loss, but this will not prevent water loss. Significant amount of water is lost through twigs, branches, roots, and stems. Early Leaf Shedding- Premature senescence and shedding of leaves is induced by drought stress. In a severe drought situation, leaves may be shed while still full of valuable materials. Effects on Photosynthesis- Reduction of photosynthesis is a major effect of drought and carbohydrate stores are being reduced. Considerable time is needed for photosynthesis to operate in pre-drought conditions. Pest Problems- Drought predisposes trees to pest and diseases due to low food reserves and poor response to insect and disease attacks. Drought creates unhealthy trees. Visible Symptoms- Deciduous trees show curling, rolling, mottling, scorching, chlorosis and early shedding of leaves. As drought intensifies dieback of twigs and branches in the tree crowns will occur. Prevents soil compaction be reducing heavy vehicle traffic or restricting such traffic to designated areas. Reduce/remove competing vegetation, especially around young trees. Plant trees that are well suited to your site (use local native species). Apply mulch around newly planted trees. Remove any weed fabric, decorative rock, etc from around the tree as far as you can go. Roots need room to breathe and grow too! Replacing with mulch helps keep moisture around the tree. During extreme drought, do not fertilize trees. Fertilizers do more harm than good. Oak wilt is a devastating tree disease caused by the fungus Bretiziella fagacearum. This disease is one of the biggest causes of the oak tree death in the Hill Country. Oak wilt can be spread both underground and above ground. If an infected beetle lands on a freshly pruned cut, it can infect the tree. Oak wilt can also be spread through root grafting. If oak tree roots have grafted together then the disease can spread from tree to tree. Oak wilt can move at a rate of 50-100 feet per year through root grafting. Most oak trees infected with oak wilt die within a few months. Oak wilt is easy to prevent and very difficult to treat. Make sure to prune at the right time of year. The best time to prune is the hottest and coldest months of the year. Sterilizing your equipment before and between each tree is very important in preventing the spread of diseases. Painting over a cut wound should be done immediately after pruning the tree so the pheromones don’t attract disease-carrying beetles. If you see suckers on the trees they shouldn’t be removed because they are needed to heal wounds and vigor. 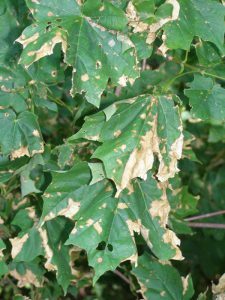 Anthracnose is a disease that can be mistaken as oak wilt easily. One of the easiest ways to distinguish the difference between the two is that oak wilt starts at the top of the canopy and anthracnose starts at the lower and inside of the tree where the humidity is highest. 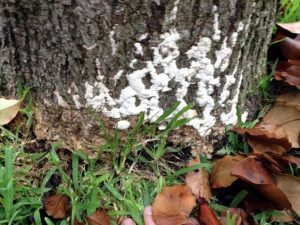 A fungus, Apiognomonia quercinia, causes oak anthracnose. The fungus affects the buds, leaves, or twigs. The leaves may begin to develop brown spots and patches. Some leaves even start to become misshaped. During the winter the fungus lies dormant in the infected leaves, but in the springtime the spores become airborne and infect the new leaves coming on. Anthracnose thrives in moist and warm conditions and can be spread by watering and rain. The best way to control anthracnose is to rake up the dead, moist leaves during the fall and winter months along with pruning the dead and dying branches. Sudden Oak Death (SOD) is caused by the plant pathogen Phytopathora ramorum. 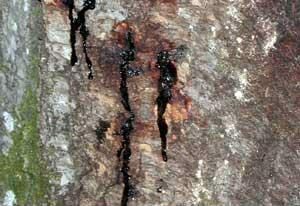 One of the first symptoms that appears is bleeding or oozing of dark reddish-brown thick sap. It is called SOD because of the rapid (2-4 week) browning of leaves without any prolonged visible decline. Even thought the death comes unexpectedly the tree could have been infected for more than 2 years before the sudden death. There are a few different way to test the tree to see if it has been infected. Foliar samples along with bark samples can be sent in for analysis. Injecting the trees with Phosphite can provide the tree with 3-5 years of protection. Root Rot is a disease that attacks the roots of trees that grow in excessively wet soil. Some of the common causes are poorly drained soil or over watered soil. If the soil is soggy it prevents the roots from absorbing the oxygen they need to live. As the roots die and decay they can spread the rot to healthy roots nearby. One of the biggest ways to help prevent root rot is to not overwater your plants or trees. Two kinds of root rot to look for in the TX Hill Country are Cotton Root Rot and Phytophthora Root Rot. 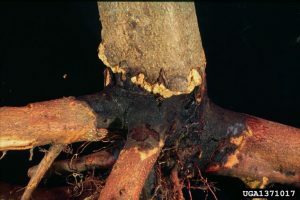 Cotton root rot is a fungus that can live for years in soil and has the ability to kill even large trees. It is most prevalent in the summer months. When a tree or plant gets cotton root rot it begins to wilt and experience foliar color changes from green to yellow to bronze. Plant or tree death comes fairly sudden during warm weather but during cooler weather the decline is slowed down but once the warm weather hits it will die. The best way to prevent cotton root rot is to purchase resistant plants or plants that are resistant to cotton root rot. Phytophthora is most commonly found in soils that are poorly drained or excessively irrigated. Early signs of phytophthora look similar to a drought stressed plant even though it is actually over watered. Some plants may wilt and die from water stress during the first sign of warm weather, but other times it can take several years. Leaves may start to appear dull or fade to yellow, red or purple. In some cases a tree can be saved by removing the soil from around the base of the tree all the way down to the top of the main roots and cutting away any bark that is oozy or dark. This leaves the root system exposed and allows the root system to dry completely which slows the spread of phytophthora. Construction damage is one of the leading causes of tree decline or death. 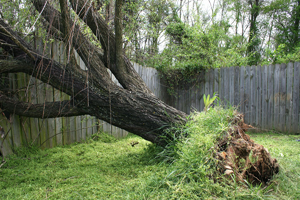 Trees you want to keep on your property should be fenced off and all building materials and equipment kept away. Tree roots do not grow in soil; they grow in the spaces between the soil particles. As the soil becomes compacted, those spaces shrink and root growth is inhibited. Roots grow shorter, thicker and have less surface area and are unable to absorb adequate nutrients and moisture, resulting in lower shoot density, a reduction in carbohydrates reserves and less drought resistance. Water that is trapped in compacted soil has difficulty moving up through the soil surface where it can evaporate and reduce soil’s temperature. Instead this soil water can heat up from increased thermal conductivity of the denser soil and begin to poach the tree roots. Compaction can result in a significant reduction of the rate at which rainwater of irrigation can penetrate the soil’s surface. 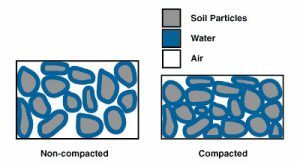 Soil compaction occurs when soil particles are pressed together, reducing pore space between them. Heavily compacted soils contain few large pores and have a reduced rate of both water infiltration and drainage from the compacted layer. This occurs because large pores are the most effective in moving water through the soil when it is saturated. In addition, the exchange of gases slows down in compacted soils, causing an increase in the likelihood of aeration-related problems. Finally, while soil compaction increases soil strength-the ability of soil to resist being moved by an applied force-a compacted soil also means that roots must exert greater force to penetrate the compacted layer. Digging, grading, and trenching associated with construction and underground utility installation can be quite damaging to roots. A tree’s root system can extend horizontally a distance 1-3 times greater than the height of a tree. It is important to cut as far away from a tree as possible to prevent damage that can compromise tree health and stability. Cutting under a tree’s crown can reduce tree vitality. Cutting roots close to the trunk severely damage a tree and limit its ability to stay upright in storms. The majority of fine water-and-mineral-absorbing roots are in the upper 6-12 inches of soil where oxygen and moisture levels tend to be best suited for growth. 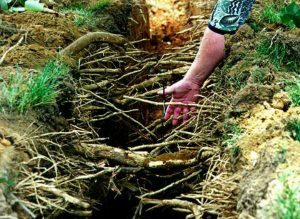 Even a few inches of soil piled over the root system to change the grade can smother fine roots and eventually lead to larger root death. Webworms (Hyphantria cunea) usually appear on trees in the fall time. They begin at caterpillars that create webbing around tree foliage while eating the leaves. This causes stress and leaf loss on the plant. The caterpillars turn to moths that in turn lay more eggs in the springtime. Over time the webworm can stress the tree enough that it can become susceptible to drought and diseases. 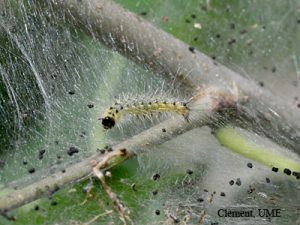 One way to get rid of webworm is by removing the leaves that contain eggs by knocking the webs out of the branches. Always knock them into a bag or bucket. Knocking them to the ground will not get rid of them. Some other ways to control the infestation is by planning sunflowers to attract wasps or hang bird feeders near the area. Both these predators will feed on the caterpillars. One other way to control them is by using BT spray, which infects the caterpillars. BT spray is not harmful to animals or plants like some pesticides but it can lower the population of butterflies in the area. ​​​​​​Iron Chlorosis is caused by iron deficiency that causes yellowing of plant leaves. 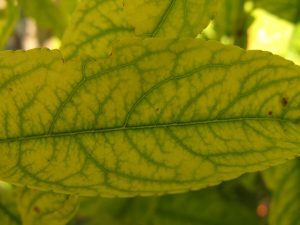 In more severe cases of iron chlorosis the entire leaf can turn yellow or even white and the outer edges may scorch and turn brown. When the leaves turn yellow it means there is alack of chlorophyll. With the reduction of chlorophyll the plant growth and vigor is reduced. Iron chlorosis occurs mostly in soils that are alkaline and soil that contains lime. Even if the soil has plenty of iron, the high soil pH can cause chemical reactions that make the iron solid, which makes it unavailable for the plant roots. Injections of ammonium citrate or iron sulfate can be used to help iron deficient trees. 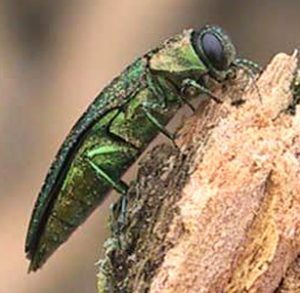 Injecting ash trees with the right insecticide helps prevent and treat trees of EAB. 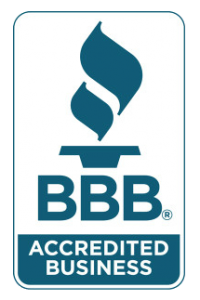 If there are infested trees with in 15 miles of your trees then you should consider treating you trees preventatively. Injecting the insecticide every 2 years is the best way to protect your trees from getting infested in the future. If your tree has already been infested for a long period of time then there is a chance the tree can’t be saved. If you notice more than 50% canopy thinning then the tree is most likely not going to.